To manage API Keys and Accounts, via the API, after enforcing Public Key Client Validation a Master API Key is required. Once Public Key Client Validation is enforced, requests with Auth Tokens will not be successful anymore and by default, API Keys are not permitted to manage Accounts or Keys. 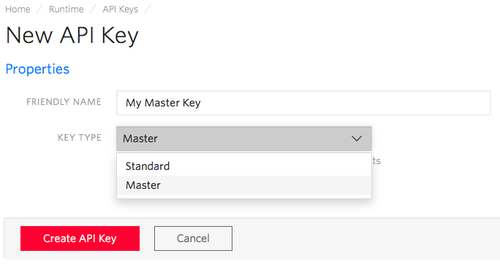 The required keys can be created in the Console by selecting Master as the Key Type. To create a new Subaccounts and make a successful API request, the newly created account needs to be primed with it's own API Key and Public Key. Only Master API Key have the permissions to execute the required steps below. Creating a new Subaccount with the key created above. The Console also supports creating API Keys and adding Public Keys for new Subaccounts.